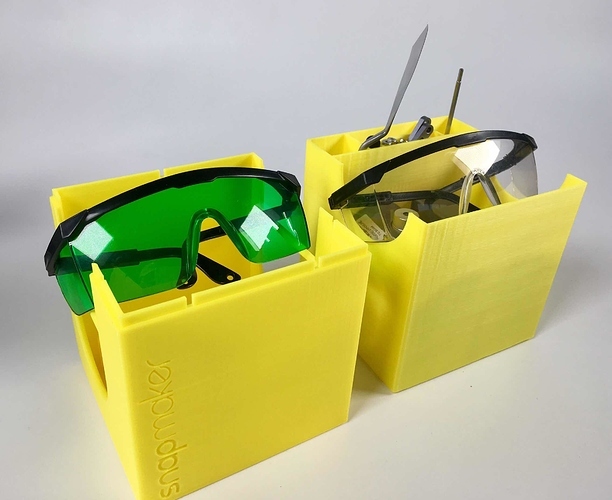 Everyone who owns a 3D printer will know we have lots of accessories which are used to make a 3D print, such as Palette Knife, Tweezer and more. 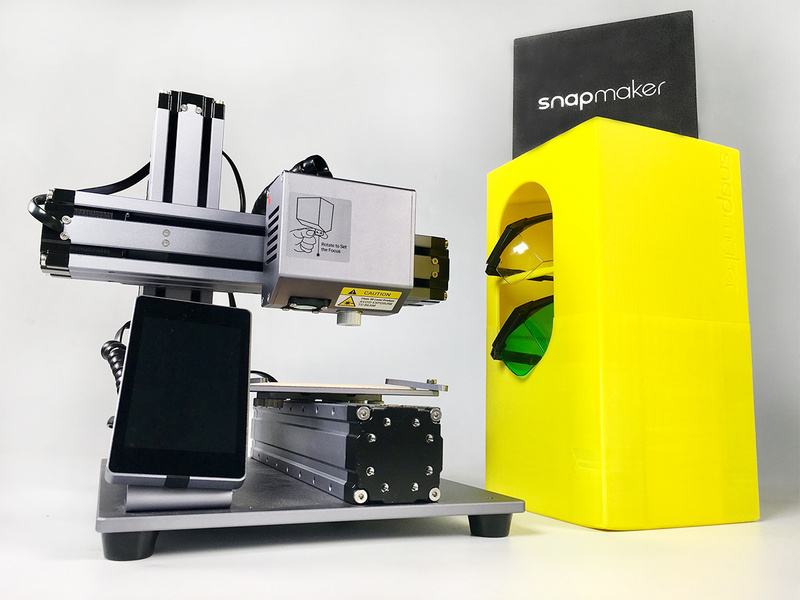 Snapmaker also include tools like 2 pairs of glasses (one for CNC, the other for laser), 3 functional modules (3D printing, Laser Engraving, CNC Carving) in the package. Thus, how to make sure every tool is here when you need them is very important. 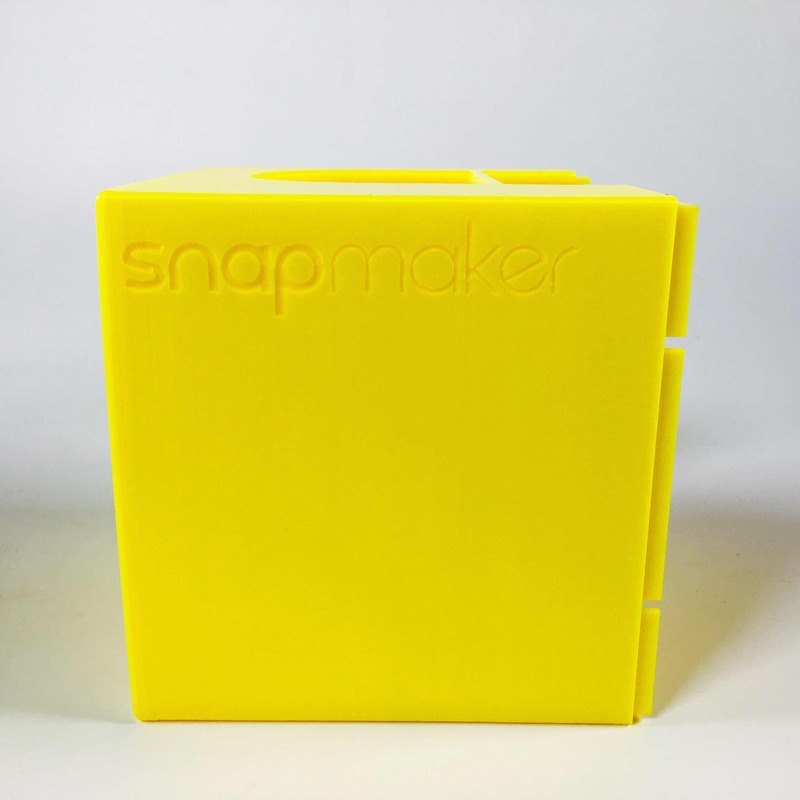 Introducing “SnapBox" , a storage box deigned for Snapaker 3-in-1 3D Printer. 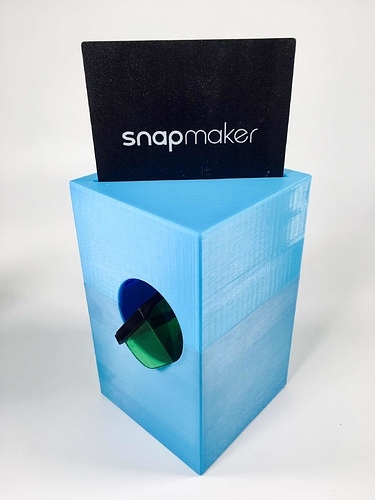 A tiny box amazingly contains all the Snapmaker accessories with such beautiful outlook and minimalist design. I am shocked at such strong capacity of containing all the tools when I finished the design. But soon, I found the groove which is used to contain the CNC bed is inharmonious with the design. What’s more, I happily realized I could do better on the utilization of space. So I started to redesign the box in order to contain 2 pairs of glasses with a more harmonious outlook. Finally, “Snapbox” was born. I achieved all my goals in “Snapbox” Version 3.0. 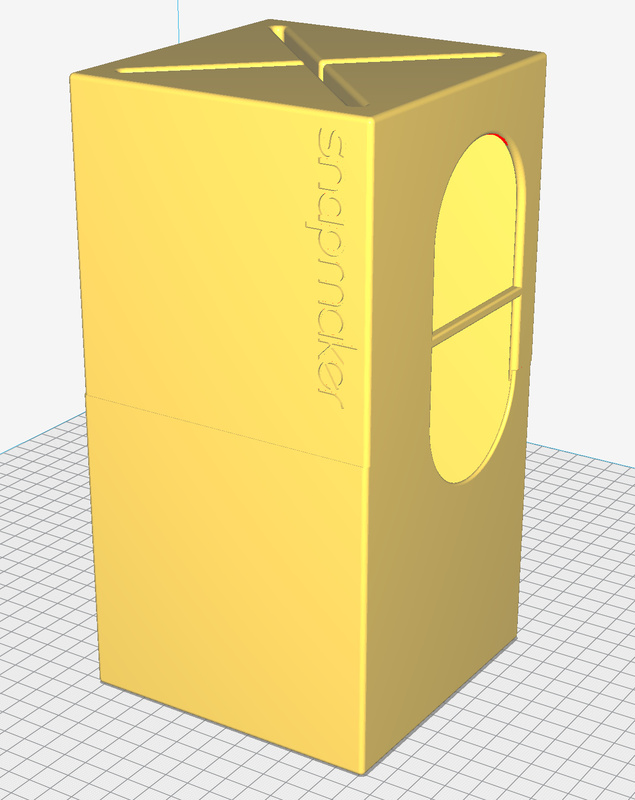 Now “Snapbox” has a wonderful outlook and minimalist design. I am glad you said something. I had the same issue. 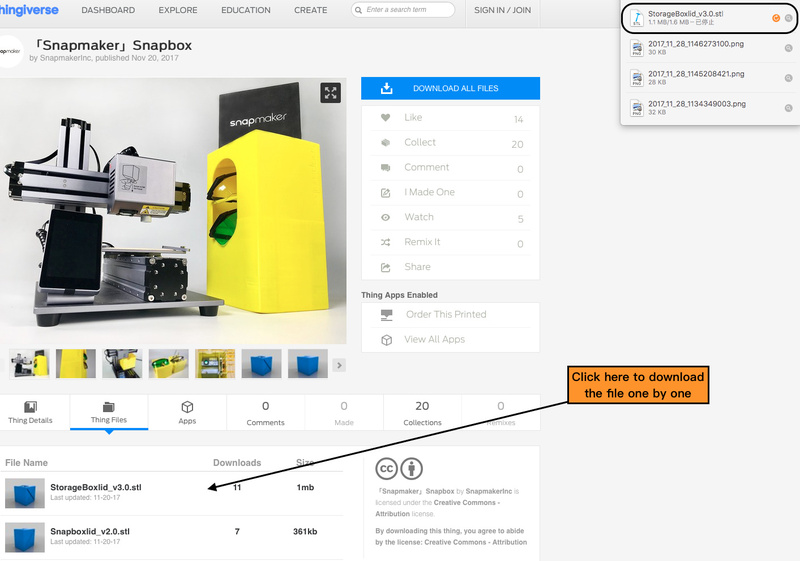 The download box never pops up when you attempt to download the print files from thingiverse right? This problem happens when I tried to download all the files too. It is a bug. 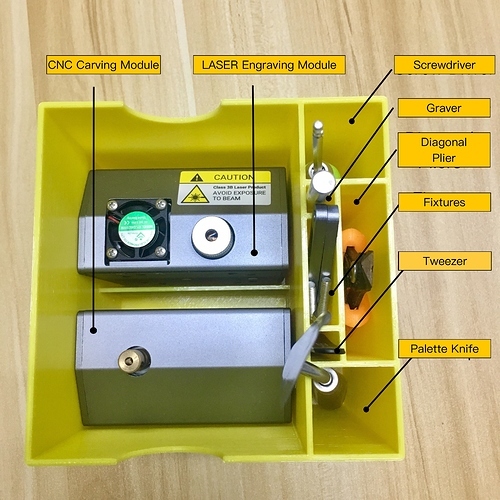 I have sent an email to Thingiverse support team. The license doesn’t forbid downloading. The files can be downloaded when I download them one by one. You can download the files one by one. The problem will be solved after I receive the reply from the Thingiverse support team. how about a zip, tar, or rar file…? is storage on snapmaker.com really expensive…? There are few people can access the forum, because the forum is under beta test now. 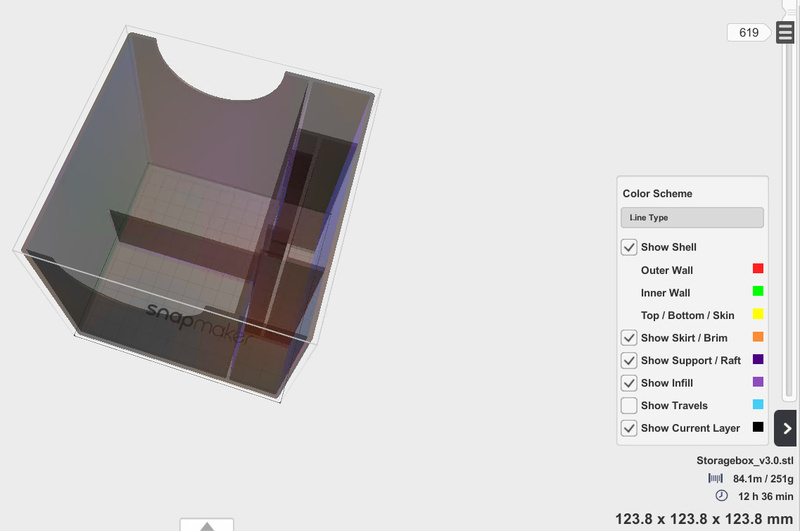 The forum didn’t have the function of uploading “stl, gcode, step” files before. 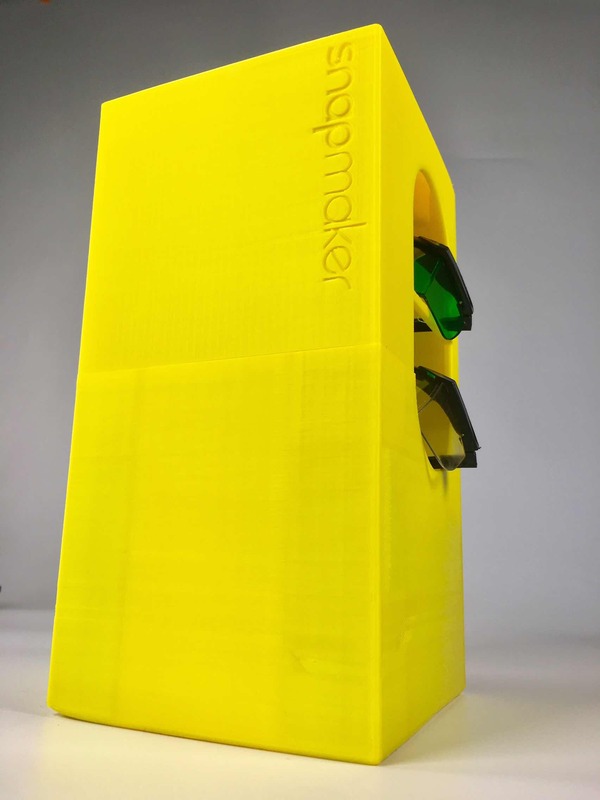 Thingiverse has millions of enthusiasts who love 3D Printers. All of them are our potential customers. I uploaded the files to our forum too to make sure that our forum is more independent. I’ve been trying to print this for a while now with no luck. if I print it straight off the snapmaker it’s fine. it will start the printing, but the temperatures are too low and it’s not sticking to the bed. 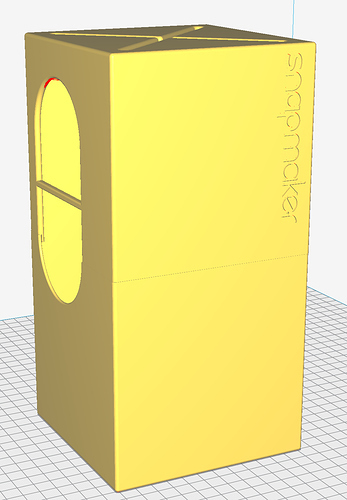 When I try and print it from the Snapmaker3D software, the print/export buttons are grayed out. 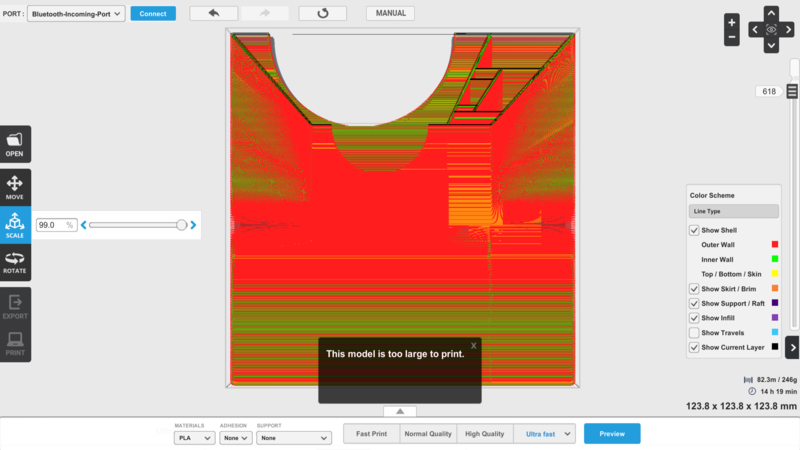 I have to scale to 97% to be able to print and it’s giving an estimate of 35 hours - far from the suggested 12. 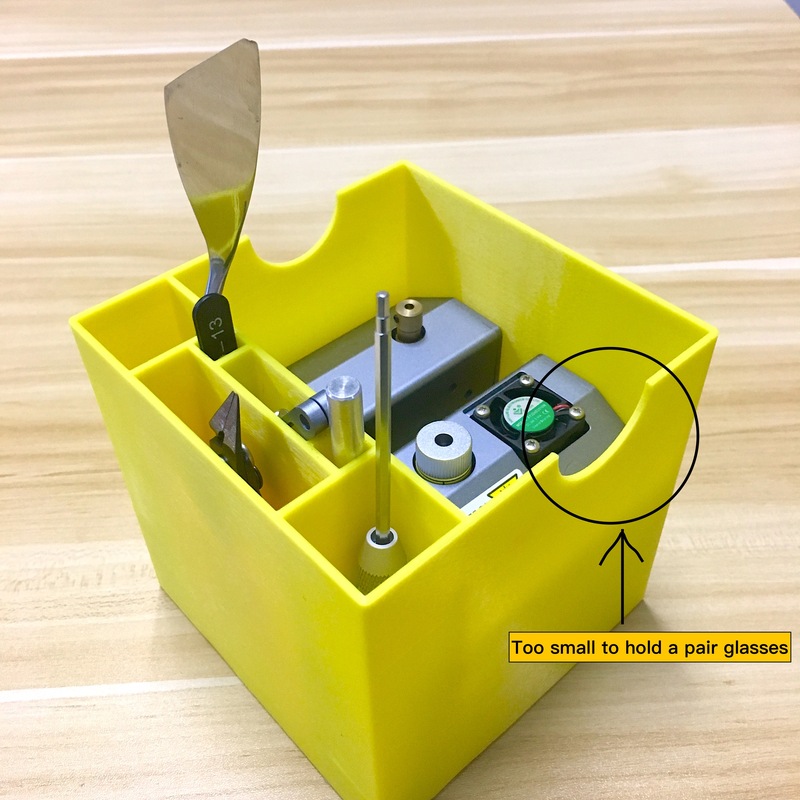 Before you print snapbox. You’d better try a simple model first to make sure the calibration is fine. Since you have a issue with sticking to heat bed, it’s better to fix it first. 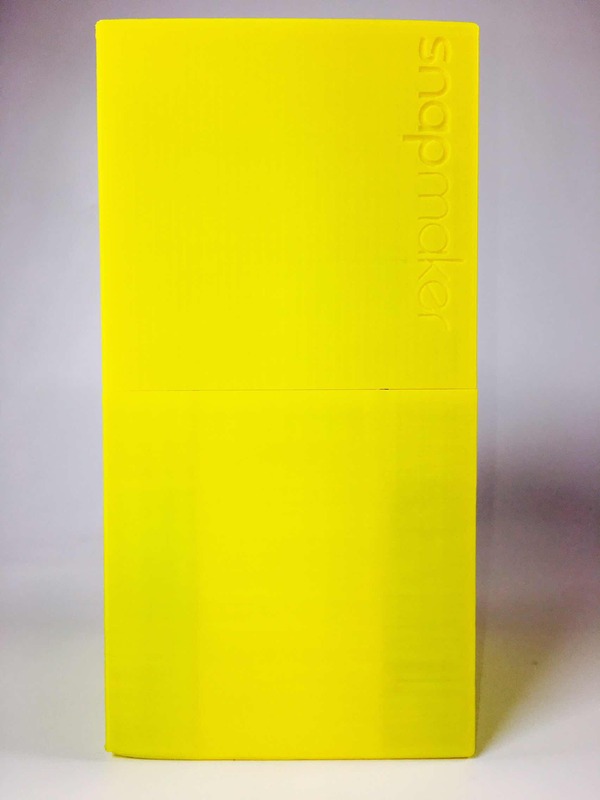 About snapbox, the first time we print the first version it took almost 30~35 hours to make a solid infill density. So I think it may relate to some printing settings, especially with infill density and print speed. I will ask Leonardo how to deal with it. Snapbox3.0 storage box scaled to 99%. When added to the slicer it was sitting on its side. I rotated it 90 degrees on the x axis so it was sitting on its base. The only reason I mention this is because the times were different when it was sitting on its side, and you would never want to print it that way anyway, it would require supports. With the below settings I printed this in 12h 35min. There was some separation between some of the layers. This may be because I had moved my printer out into the garage as I didn’t want to listen to the printer run for 12 hours. I am in Iowa, and it is cold here at the moment. The issues with the separation could have been due to the drastic change in temperature when I opened my garage door a couple times during the print. Even if you don’t want to print as fast as I did, do not hesitate to lower the infill. Did you use Brim or Raft for Adhesion? That may be the reason why the software is not able to generate G-code. 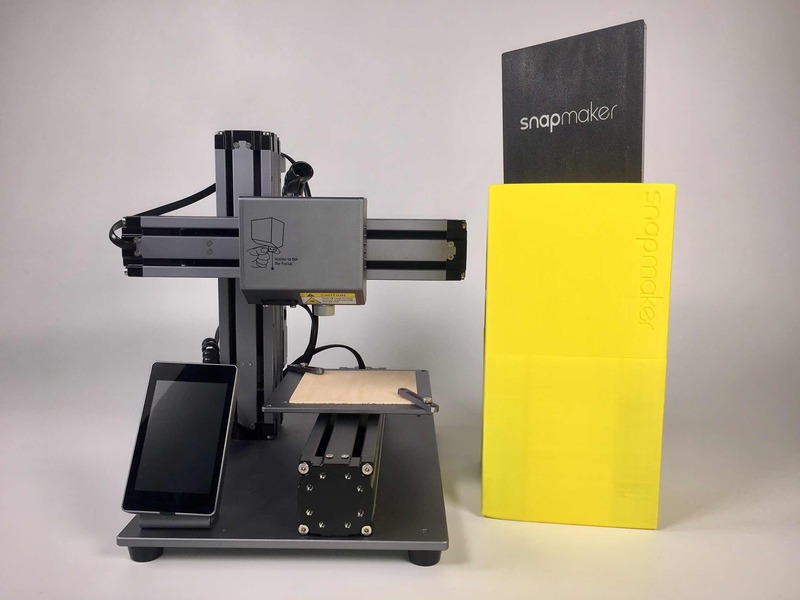 With the Brim and Raft, the print may be larger than the heated bed and it is not printable. Did you have to print with supports for the top box with the “X” that holds the CNC plate? I was thinking of printing it upside down, but what about the bridge that holds the safety glasses? Will the printer be able to bridge that without supports? Nop, no adhesion helpers, no supports…just your speedup options and scaled to 99%. BTW, I’m using snapmaker3d 1.6.2. No reason to use supports. I printed with the bottom, on the bottom. Orient it the way Vox shows. EDIT: I think I misunderstood what you were saying. I only printed the base. I never printed the top. I agree with you that it looks like the lid will need some kind of support. I didn’t export. I printed straight from snapmaker3d. I have a laptop dedicated to the printer and since that has a battery on it (built in UPS) I have no reason to export and print from the sd card.